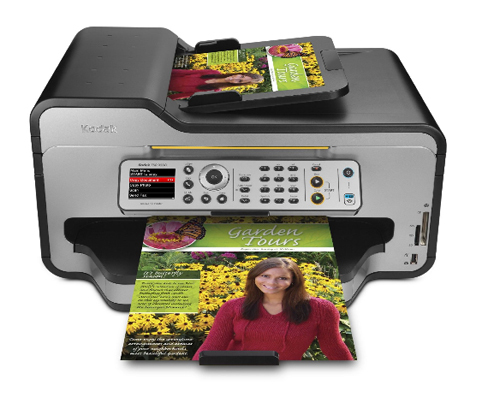 Printer Comparison has tested an All-in-One printer from Kodak. The printer is called Kodak ESP 9250 and is able to print up to 32 pages per minute or so Kodak claims. It also has a 2.4″ LCD screen and wireless connectivity. Printer Comparison ends up giving the Kodak ESP 9250 an overall rating of 3.5 stars out of 5 possible. The Kodak printer scores highest on features, operational costs, performance and print speeds and a bit lower on print quality, service and support. On the positive sides we find that the printer has simple navigation, great software and easy setup, but it has some negative issues like poor draft print quality and the quality of black and white photos could have been better. Read the full review of the Kodak ESP 9250 All-in-One printer here.